Emilio first soloed at age fifteen. He has been flying ever since. His list of past flying jobs includes flight instructing, charter flying, corporate, time critical freight, air ambulance, aerial photography, regional airline, and major airline. He holds type ratings in the Lear Jet, ATR 42 & 72, A320, DC-9 MD80, and Boeing 757/767. He has over 25,000 hours of total flight time. He is a graduate of St. Louis University where he received a degree in Aeronautics. In 1985, Emilio started his first company. Apollo Software was the first company to market a computerized trip quoting system for air charter companies. His next business venture was Odyssey Interactive. Emilio, along with three business partners, began Odyssey Interactive to create multimedia CD-ROMs. The company’s first and only CD-ROM was Apollo XIII: A Week to Remember. This award-winning CD-ROM tells the dramatic story of the Apollo 13 space flight through a combination of still images, narration, animation, an original soundtrack, newspaper articles and interviews with the astronauts and five of the controllers who worked the flight. Emilio was the writer, programmer, and project manager on the CD-ROM. Emilio’s writing career began after he sold his first article to Flying magazine. From there he went on to become a regular contributor to Professional Pilot magazine where he wrote on a number of topics relevant to the general aviation industry. He also published articles in the Chicago Tribune and Multimedia Producer magazine. Emilio currently writes about nonfiction books, films, and documentaries on his blog EverythingNonfiction.com. 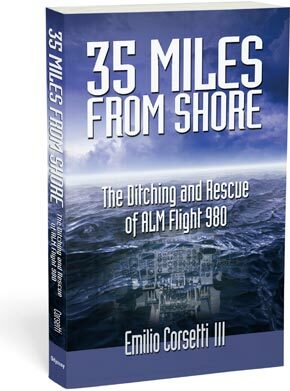 Emilio’s first book – 35 Miles From Shore : The Ditching and Rescue of ALM Flight 980 – tells the dramatic story of the first and only open-water ditching of a commercial jet. Emilio’s latest book Scapegoat: A Flight Crew’s Journey from Heroes to Villains to Redemption tells the true story of an airline crew that was wrongly blamed for causing a near fatal accident and the captain’s decades-long battle to clear his name. Emilio Corsetti has appeared as an aviation expert on the show Studio B with Shepard Smith and in the MSNBC documentary Why Planes Crash: Brace for Impact. In addition to writing, Emilio works as a pilot for a major airline. He and his wife Lynn reside in Dallas, TX.